Lush Times Xmas 2008: A double magic spell for vitality and prosperity. If we told you that there was a surprise inside, it wouldn’t be a surprise anymore, would it? So we won’t. This is a bright turquoise quadrodecahedral * (*It has 14 sides) Ballistic that turns your bathwater a deep shade of sapphire blue, the colour of a mountain lake, so there must be something magical inside it. Seen from the top, Magic is a hexagon, a “hex” Ballistic, with a blend of marjoram and rose in the turquoise shell to dissolve away your anxieties. Then, as the water changed colour, basil and peppermint essential oils swirls into your magical bath, symbolishing growth, vitality and energy. When your sprig of parsley floats free, that’s to bring you prosperity. Magic is Lush’s Yuletide spell for everyone, to wish you good luck for 2009, to help you banish bad things to the past and bring you a brighter future. Ingredients: 2828 Magic £3.10 Sodium Bicarbonate, Citric Acid, Perfume, Marjoram oil (Thymus mastichina), Rose absolute (Rosa damascena), Basil oil (Ocimum basilicum), Peppermint Oil (Mentha piperita), *Eugenol, *Geraniol, *Benzyl Benzoate, *Citronellol, *Linalool, Colour 42045, Colour 18050, Fresh Parsley Sprig (Carum petroselinum). 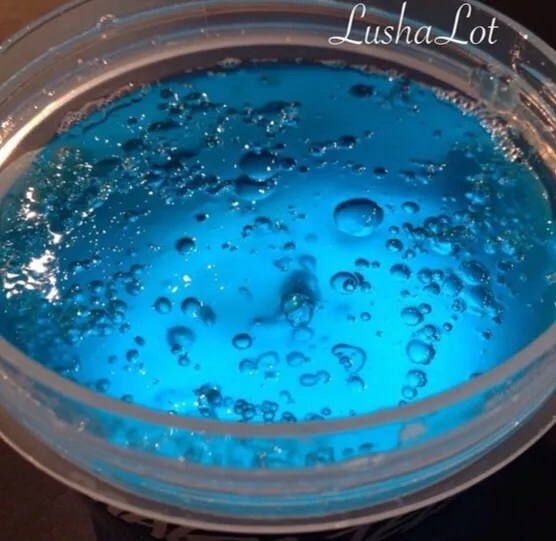 Posted on August 28, 2015 by Lushalot	• This entry was posted in Bath Bombs, Halloween Past, Lush Kitchen menus and product demos and tagged basil, blue, color changing, halloween past, herbal, herbs, love spell gift, lush kitchen, lush kitchen October 2015, lush magic, magic bath bomb, marjoram, octagonal, parsley, peppermint, purple, quadrodecahedral, rose, turquoise, video. Bookmark the permalink.